It was a busy morning for this group of anglers last Tuesday. 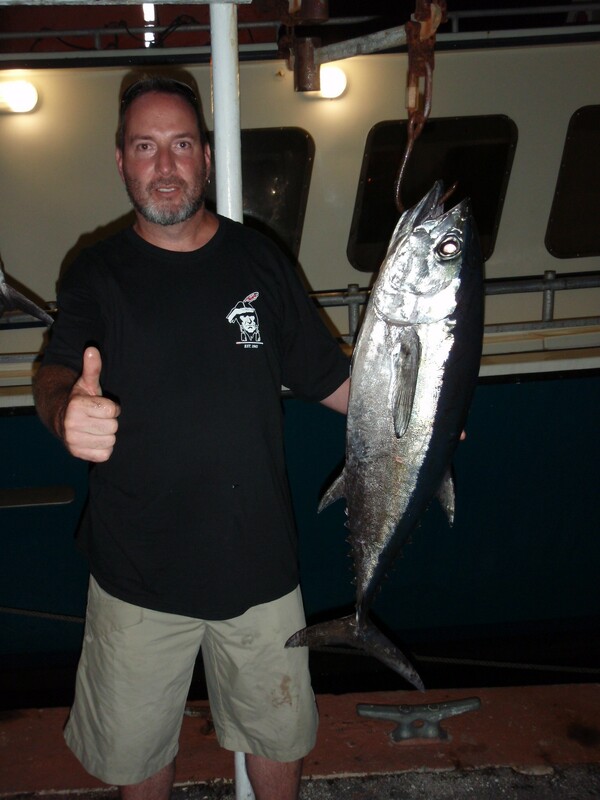 Despite fighting plenty of False Albacore they found enough energy to land King Mackerel to 20 pounds, release a Sailfish, boat a Greater Amberjack of 34 pounds and also placed some fine eating Cero Mackerel in the cooler along with a few Yellow-tail Snapper. Congratulations on a wonderful catch folks! 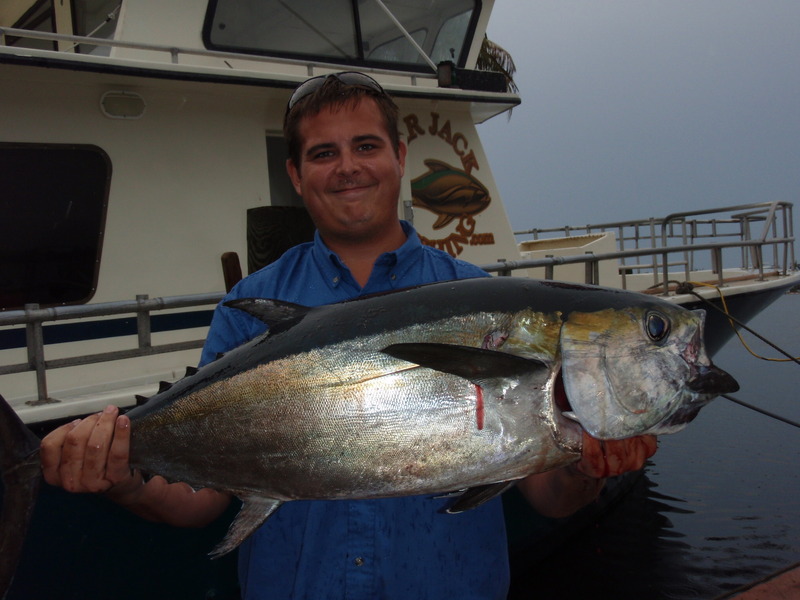 VIP angler Mark displays his 31 pound Black-fin Tuna caught during an overcast and stormy afternoon trip. 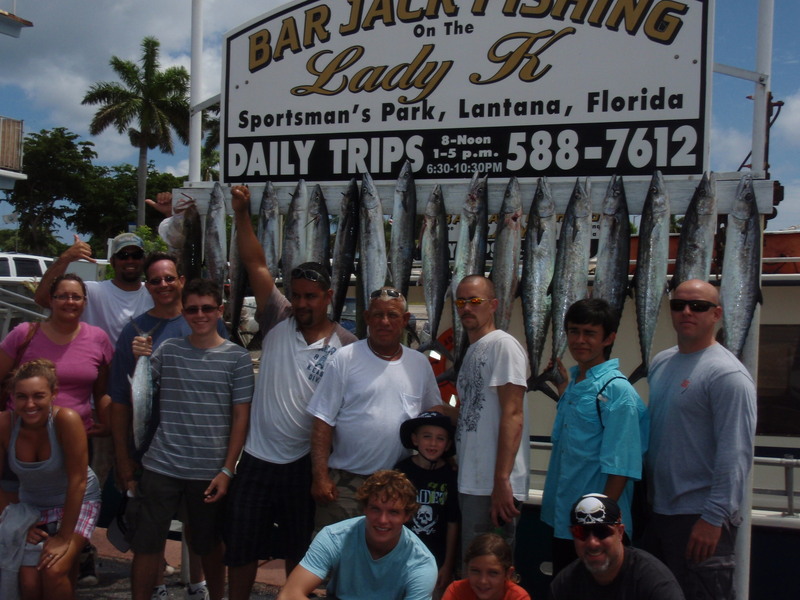 The fish was one of three hooked while anglers were fishing deep for King Mackerel off Boynton Beach using dead sardines. These tuna generally run with the False Albacore and will make a long, fast run followed by a series of slow and deep circles on their way back to the boat. What a fun fish to fight and a delightful dish for the dinner table. 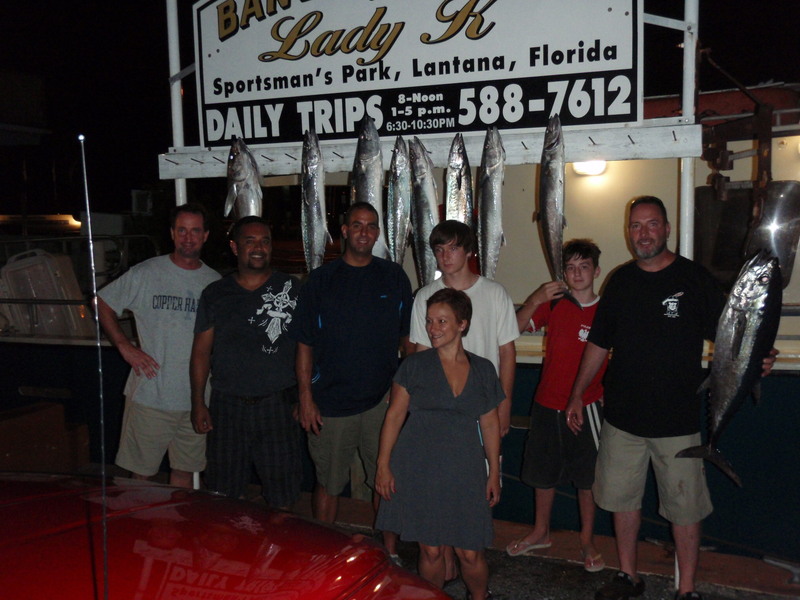 A light crowd during this night trip had plenty of action with two Black-fin Tuna, a Great Barracuda release, a Sandbar Shark release and King Mackerel to 30 pounds. All the fish were taken on boat rods rigged with one ounce knocker rigs and baited with sardines. Everyone had a great time catching fish while witnessing the marine life that swam around under the lights of the Lady K, something you don’t see everyday. A thumbs up for a catch of a lifetime caught aboard the Lady K.
Other catches this week also include a few Cobia to 25 pounds, Yellow-tail Snapper, Mutton Snapper, Mangrove Snapper and Almaco Jacks. The Lady K has also had several Sandbar Shark releases between 100 to 300 pounds caught on sardines. Our experienced crews will not only help teach you how to use the fishing equipment but also assist in helping you to land your catch. The Lady K is an open boat so no reservations are needed, just plan which trip fits your schedule best and show up at the dock, we’ll do the rest.